If I were a betting man, I’d say virtually every modern-day whitetail bowhunter at some point has dreamed of killing a mature buck on public dirt. I know I have! Imagine for a minute: You’ve spent months and even years in some cases planning, preparing and scouting, and once the season arrives you spend untold hours out-witting other hunters, reading sign and checking trail cameras. Finally it happens and you’re ready. Your heart races and your hands tremble with each step the buck takes closer, and in the far corners of your mind you hope the arrow flies true. The crack of the arrow’s impact echoes through the morning’s stillness and you’re in disbelief as you climb down to solid ground. Wrapping your hands around the antlers seems surreal at first, and as you notch your tag the whole effort comes into perspective. The sweat equity finally pays off and you could not be more pleased with your public land prize. I’m not ashamed to admit that those are the moments I long for as a bowhunter. There truly is something special about putting the public land pieces together in the whitetail woods. Not only do you come away with protein for the freezer, bone for the wall and memories to cherish, but accomplishing such a difficult challenge is really the “trophy” in my opinion. That being said, every fall bowhunters hit the public woods in earnest searching for this whitetail nirvana. Most go away with their efforts foiled either by their own shortcomings or the wisdom that a mature public land buck has earned over many seasons. However, some find pay dirt and have the opportunity to drag their hard-earned success back to their truck along with the experience that will ultimately make them a better whitetail bowhunter. Luckily for us, I rounded up a handful of these successful public land bowhunters and as they shared every detail of their experience this past fall, we are able to get a glimpse of their successes and begin to put our own public land puzzle together. Like most bowhunters hailing from eastern Pennsylvania, Ryan Smith had dreamed of killing a mature whitetail as he grew older. Although Pennsylvania has seen an uptick of mature bucks coming from within its heavily hunted borders in recent years, it has never been considered a top-end trophy destination and likely never will be. In fact, in a recent QDMA survey, the Keystone State ranks No. 1 in hunter density in the Lower 48 at more than 20 per square mile, and with that many hunters to out-maneuver, very few bucks reach maturity. Ryan knew that if he wanted to kill a mature whitetail he would have to find greener pastures elsewhere. After four years of applying, he had that opportunity this past season in the form of an Iowa deer tag. Hunting private ground with an outfitter wasn’t in the cards, so with Iowa offering a good sampling of public land to choose from, he contacted local wildlife officials and residents who were willing to share bits and pieces of information to help him start putting the public land puzzle together. In Ryan’s mind it was pretty simple: Hunt where most other hunters are unwilling to go, and when they are less likely to be there. So with dates nailed down for the last few days of October into November, he headed to the Hawkeye State. During his cyber scouting and phone visits with the local wildlife officials, Ryan narrowed his hopes to a pair of public tracts he was certain held promise. Upon arrival, both predetermined locations were scouted and stands were hung and the hunt was on. The first couple days proved fruitless. Although deer activity was prevalent, by the end of day No. 2 activity had slowed. In Ryan’s opinion, because he was hunting with his dad and best friend, who also drew tags, he felt that the scouting and hunting pressure the property had received from them slowed the activity. So on the third day they moved their efforts to another property and that’s when everything came together. With a cold front passing through the previous evening that dropped temperatures in the mid-20s on Halloween morning, coupled with a good rutting moon phase, Ryan slipped up the tree for an all-day hunt. Like a switch had been flipped, buck activity was high and by mid-day nearly a half-dozen bucks had slipped past the river-bottom pinch point he was guarding. As Ryan was thinking about the buck parade he had witnessed that morning, he was brought back to his senses when he heard the unmistakable sound of a chase. One quick glance through his binoculars confirmed it was a shooter. When the chasing stopped and the woods grew quiet, Ryan threw a couple soft grunts in the buck’s direction. As if scripted, the buck turned and headed directly toward Ryan’s tree at a steady pace; and when the buck stepped into an 18-yard shooting window, the buck paused. In a matter of seconds the wise old buck knew something was awry, and as he started to turn Ryan released his lung-thumping arrow. 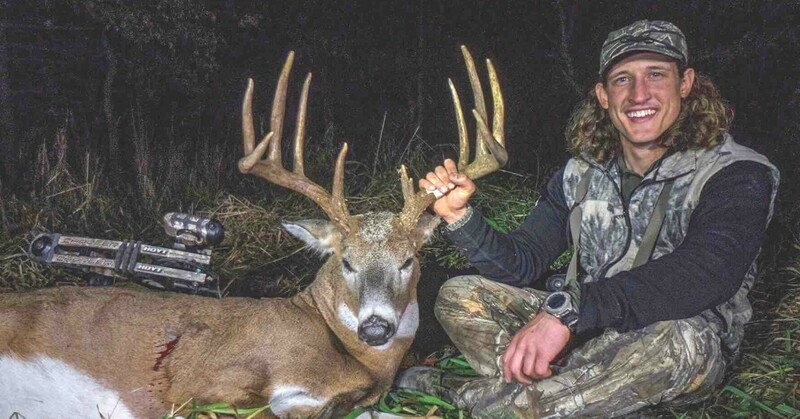 A cold front coupled with limited hunting pressure were keys to success when Pennsylvania hunter Ryan Smith took to Iowa’s public lands in search a dream buck. Killing a public land Booner rarely comes easy, but if you use Mother Nature, a whitetail’s seasonal tendency and hunting pressure to your advantage, you can stack the odds in your favor. Timing was everything on Ryan’s hunt. Although most public land bowhunters want to hunt during the peak of the rut, your chances of killing a mature buck are just as good — some would say even better — the last week of October into the first few days of November. Not only will choosing this timeframe significantly limit the number of hunters to compete with, but it’s also during this time that mature bucks start moving during daylight hours more. The weather also played a role in Ryan’s success. An October cold front always increases deer activity. In this case, with temperatures hovering in the 20s, coupled with the increased natural movement late October generally ushers in, Halloween was obviously an optimal time to be in the tree with a grunt tube in your hand. Lastly, Ryan really believes that the moon phase was a factor as well. Ryan is a student of Mark Drury’s thoughts on the moon and its effect on deer activity. According to Drury, the several days before and after a full moon can be an ideal time to catch a buck on his feet regardless of the time of year, but when you throw in a cold front close to November, it can lead to Booner gold. The full moon last fall was on November 3, so if you’re not a believer in the moon’s effect, maybe you should be! Northern Idaho bowhunter Troy Pottenger has been chasing the mountain bucks of the Northwest for more than 30 years. Although this region barely gets noticed by most whitetail enthusiasts, in Troy’s opinion the mountains of northeast Washington, northern Idaho and northwest Montana are an untapped whitetail resource for the public land bowhunter. Over the years he has taken nearly 30 P&Y whitetails from this mountainous region, but what’s even more impressive is that the vast majority came from public dirt. Like most seasons before, Troy’s intense scouting efforts had put him into position to anchor another western king. Throughout the year Troy keeps tab on these bucks with the use of 50-plus trail cameras, countless hours looking for sheds and even more time actually scouting during the summer months. In fact, Troy has enjoyed some level of history with every buck he has killed across the region in the last decade. When he climbed into his stand on December 9 this past season, he hoped that history on a particular buck he knew well would be coming to a close. Bucks in this region have vast home ranges compared to those in other parts of the country, and even larger rut ranges. But as the rut was beginning to slow down, he knew that a particular buck would be heading to what Troy considered the buck’s rut recovery area. For the past two seasons, Troy has recovered one buck’s 3- and 4-year-old sheds on the same south-facing slope, and he was able to put eyes on the then 2-year-old buck in the same area. Because the area held the type of food source whitetails are seeking this time of year and the security cover they need to survive another long Idaho winter, Troy wasn’t surprised when the buck showed up on a trail camera once again in early December. Slipping in undetected, Troy settled in on a small bench where a couple heavily timbered finger ridges came together that held three large community scrapes. Although the rut was winding down, these types of scrapes are whitetail communication hubs throughout much of the year, and Troy knew that the buck would eventually pay them a visit. With the wind perfect, Troy watched as a couple does eased by, and a short time later the mature buck he was after slipped into view. Like clockwork the buck followed the same general path the previous does took, and when he paused to check a scrape, Troy touched his release. As the sound of a crashing public land buck filled the thin mountain air, Troy knew another mountain king had fallen. By sitting on a trio of late-season community scrapes, Idaho public land buck hunter Troy Pottenger earned a date with this monster. When it comes to targeting a specific western buck or any buck for that matter, Troy hunts them when he knows they are in the area. With a general home range of several miles and up to 10 miles during the rut in some cases, going in when he knew the buck was going to stay put was key. Trying to chase a specific buck during the rut can be fun at times, but an act of futility as well. Having a buck patterned makes the whole affair much simpler. Understanding wind currents and how you enter and exit an area undetected were also factors on Troy’s hunt. With the growing population of wolves, mountain lions and bears, these mountain whitetails are hunted 365 days a year and they have to be on their guard to survive. According to Troy, mature whitetail bucks always bed in areas that provide them the best wind advantage, and the same is true when they travel. That being said, hunting wind edges created by terrain features allows you to hunt areas that naturally funnel whitetails while also providing bucks a wind advantage when traveling. Lastly, in the mornings consider approaching stand locations from the backside or behind the bedding area to avoid disturbing deer while they feed or are moving up the mountain on their way to bed. In the evenings, take the opposite approach and come from the feeding side of the bedding area to avoid disturbing them, and don’t be afraid to hunt close to their bedding area. Troy was less than 200 yards from where the buck was bedding, but he moved in undetected and hunted the wind’s edge so the buck felt secure. If you’ve paid any attention to the popular hunting show “Midwest Whitetails” or the current YouTube channel The Hunting Public, Zach Ferenbaugh is no doubt a familiar face. For the past several years both he and Aaron Warbritton have been zeroing in on Iowa’s public land whitetails, and it seems every season they are able to beat the odds and nail down a couple mature bucks. As a whitetail bowhunter that pretty much hunts on public dirt exclusively, Zach often takes an unconventional approach, and that’s exactly what happened last November. It was all about being mobile that particular day, so with a ghillie suit on his back, a bow in his hand and a cameraman as his wingman, Zach slipped into the woods with high hopes. After a frosty morning hunt from the ground that yielded some light activity and an encounter with another hunter, Zach and his cameraman headed back out that afternoon with a new plan. Scouting has always played a pivotal role in Zach’s public land success, and this particular location was no different. From late-winter scouting trips to additional efforts during the summer months, Zach had zeroed in on a cattail marsh he knew held both bucks and does. It was also far enough away to keep most hunters at bay, and held the transitional cover and a well-used cornfield that provided all the proof he needed. Scrapes, rubs and large buck tracks were littered along its edges, and the closer he got to the bedding area, the heavier the sign became. With numerous deer trails leading from the bedding marsh to a strip of canary grass that lead into the cornfield, Zach hunkered down in his ghillie suit and waited. Zach’s whitetail intuition told him it was a good spot, and as he was glassing the marsh for any hint of movement, the crack of a snapping stick and a wall of tines caught his attention. In a matter of seconds the once slow evening hunt had turned on a dime as the buck came into view crossing several doe trails that led to the feeding and bedding areas. With a quick grunt to stop the buck and even a quicker arrow to put him down, Zach was soon standing over his largest public land buck to date. A ghillie suit and a ground ambush, though not conventional, led to the demise of Zach’s public land buck. Don’t be afraid to step out of the norm. Although there are many aspects that led to Zach’s success, scouting is no doubt the main tool that put him into position on this hunt. He spends countless hours throughout the year scouting numerous properties with a systemic approach. First off, he scouts multiple properties of all sizes. In his experience, properties can change from season to season based on hunter density, food sources and the overall health of the deer herd, and having multiple scouted spots is a must. Secondly, he pours over maps and aerial photos trying to understand every detail about the property on both a macro and micro level. He’s not only looking for access points, elevation changes, possible food, water and bedding sources and the overall lay of the land, but more importantly, transition lines of cover with multiple habitat types. These are natural travel areas mature bucks use, and when incorporated with bedding and feeding locations, you’ve tapped into a likely hotspot at some point in the season. After a good bird’s-eye view is understood, it’s time to scout and confirm your suspicions. Zach doesn’t waste much time with trail cameras. Although they can be a valuable tool, just as valuable are fresh buck tracks, rubs and scrapes. Lastly, you don’t always have to hunt from a treestand. For Zach, hunting from the ground not only allows him to be mobile and make changes more seamlessly, but also provides additional scouting opportunities to find fresh sign that hunting from a fixed position can’t. Check out The Hunting Public episode below to watch Zach Ferenbaugh tag his 2017 Iowa bruiser from the ground.